Small and portable for when you aren’t using it. The iClever IC-BK03W portable folding ultra slim Bluetooth keyboard is down to $19.71 with code ICELBK03 on Amazon. This keyboard has been selling steadily around $29. We shared a couple deals on the black version of this keyboard around Black Friday last year, but this is the first code we’ve seen that worked on the white version. This seems like the perfect keyboard for when you’re traveling and something comes up: maybe you get inspiration for a great idea or just need to fill out a form you hadn’t filled out before. You can just unfold this slim keyboard and do what you need to do. It’s compatible with iOS, Android, and Windows. 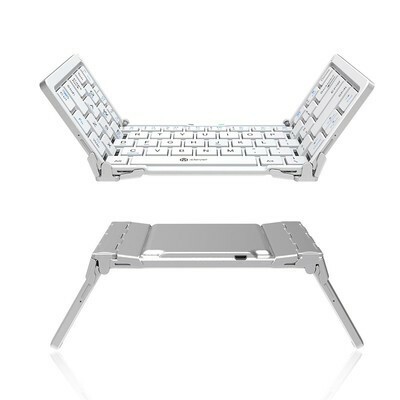 The built-in Bluetooth has a range of 33 feet, and the keyboard is made with a premium aluminum alloy for durability. It automatically goes into sleep mode and powers off to save the battery, which is easily rechargeable. The keyboard has 4.4 stars based on 712 user reviews.